How can I help Mary House guests? We request, in order of importance – Prayer, Presence and Presents. Presents of your old magazines, furniture, cars and clothing; new white athletic socks, and extra food or small amounts of money. Got a Randall’s Shopping Card? Randall’s will give Mary House five percent of your grocery purchase each time you use your card. Ask Customer Service to change your designated number to 12377, and you can support Mary House each time you shop at Randall’s. 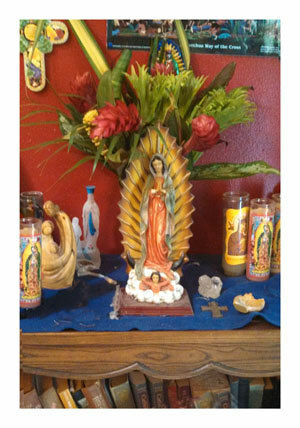 Mary House Catholic Worker of Austin, Inc.
© Mary House Catholic Worker of Austin, Inc. All rights reserved. Content from this web site may be used, as long as it is appropriately cited. 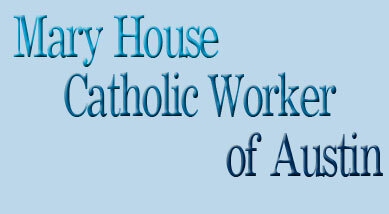 Help Us page, Mary House Catholic Worker of Austin, Inc., http://www.catholicworkeraustin.com/help.html.